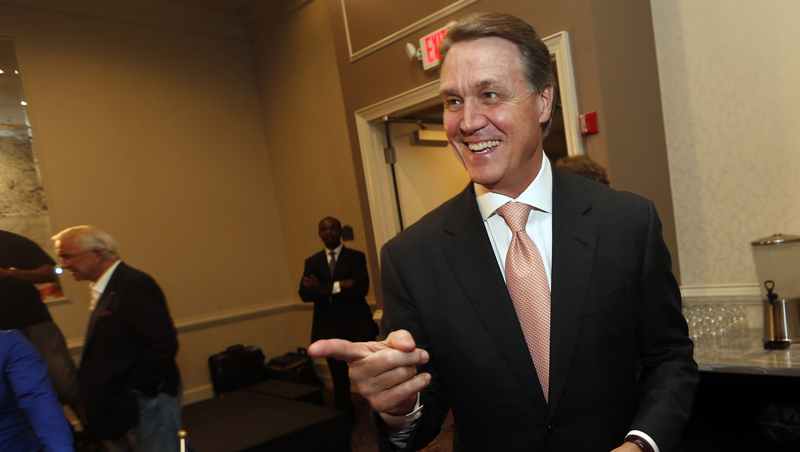 ATLANTA - Businessman David Perdue has defeated longtime Rep. Jack Kingston in the Republican runoff for Georgia's U.S. Senate nomination, setting up a nationally significant general election matchup against Democrat Michelle Nunn. Tuesday night's primary runoff win validates the former corporate CEO's campaign as an outsider. The former CEO of Reebok, Dollar General and the failed textile firm Pillowtex, Perdue offered his private sector record and tremendous wealth as proof that he can help solve the nation's ills in a Congress largely devoid of experience business titans. He spent more than $3 million of his own money blasting Kingston - and other primary rivals before that - as a career politician, including one ad depicting his rivals as crying babies. With 99 percent of the precincts reporting, Perdue led Kingston by about 8,000 votes - enough for 50.9 percent of the vote. Perdue also led Kingston in the initial May primary, but both men fell well shy of the majority necessary to win without a runoff. As he did in May, Kingston ran up huge margins across southeast Georgia, where he's represented Georgia's 1st Congressional District since 1993. In his home Chatham County, he won 86 percent, with about 12,500 more votes than Perdue. But Perdue erased Kingston's home base advantage by running more consistently around the rest of the state, particularly in the heavily populated Atlanta and its suburbs. Perdue won Fulton County and all the surrounding counties that make up the metropolitan area. With the win, Perdue overcame a Kingston coalition that spanned the internal GOP struggle between tea party conservatives and traditional GOP powers. Kingston ran with the endorsement and more than $2.3 million in advertising support from the U.S. Chamber of Commerce, a titan of the Washington establishment. But he also garnered backing from tea party leaders and Karen Handel, the tea party favorite who finished third in the May primary. Kingston, 59, ran as an 11-term congressman in a year when voters have expressed widespread dissatisfaction with the nation's direction, arguing that his record proves his conservative credentials. He pitched his range of endorsements as proof of his appeal across ideological barriers. Yet the returns suggest that wasn't enough to trump a political reality: Americans typically love their congressman but loathe Congress as a whole. Kingston said leading up to the runoff vote that he would back Perdue in November if he won the nomination, saying that the higher priority is displacing Nevada Sen. Harry Reid as majority leader. Republicans need six more seats to win Senate control and cannot afford to lose retiring Sen. Saxby Chambliss' seat. National Democrats view Nunn, the 47-year-old daughter of former Sen. Sam Nunn, as one of their best opportunities to pick up a GOP-held seat. She's raised more than $9 million and reported $2.3 million left to spend earlier this month. Perdue reported less than $800,000, but his personal wealth ensures that his campaign doesn't have to worry about money. Perdue's win could require a strategic shift for the new Republican nominee and his Democratic opponent, since they now can't simply run against the sitting Congress and its discord. Nunn, an Atlanta nonprofit executive, uses her father, an old-guard Southern Democrat who served four terms, as an example of what kind of senator she'd be. She also eagerly highlights her tenure as executive of Republican former President George H.W. Bush's foundation.